During World War I, Dr. Harold Major, pastor of First Baptist Church, suggested to the Chattanooga Kiwanis Club that a memorial of some kind should be undertaken for those from Chattanooga who were in the war effort. The Kiwanians began discussing the idea and Frank Mahoney suggested that the memorial should be in the form of a city auditorium. The old auditorium on Ninth street had never proven adequate, and it was badly damaged by a fire. The Kiwanis Club formed a memorial committee, and it recommended that the city of Chattanooga issue $400,000 in bonds "for the purpose of building a memorial auditorium." The necessary legislation was secured, and the voters of Chattanooga approved the auditorium by a vote of more than three to one in a referendum held March 11, 1919. A Soldiers and Sailors Memorial Auditorium Commission was appointed, including D. A. Landress, George Patten, Fred Dearing, Milton Ochs and Z. W. Wheland. This commission, on September 24, 1919, paid $100,000 (an absolutely immense sum in those days) to James A. Caldwell for his residence site at McCallie and Lindsay, running back to Oak Street. The fine old Caldwell home was then torn down, and the beautiful shrubbery and flowers on the grounds were transplanted to other Chattanooga yards. R. H. Hunt was chosen to draw the plans for the new Memorial Auditorium. The cornerstone was laid Saturday, November 11, 1922, which was the fourth anniversary of the signing of the armistice that ended the war. For this ceremony, downtown business was suspended and a great crowd gathered at the Tivoli Theatre. At two minutes to twelve, a cannon boomed from atop Cameron Hill and every factory whistle in the city joined in the announcement. Then, at the stroke of twelve, all traffic came to a halt and citizens stopped whatever they were doing for two minutes of silent tribute to those who gave their lives in the great war. During these two minutes, taps were blown by ten trumpeters from the top of a tall, downtown building. Upon the conclusion of taps, seven volleys were fired by an entire troop of cavalry from the same location. Then the crowd made its way to the McCallie Avenue site for still another impressive ceremony. Work then began on building the handsome auditorium, which extended the length of the block back to Oak Street. The final cost of the auditorium was $700,000. Right from the early stages of planning, the Chattanooga Music Club assumed an active role, as the club wanted plans to include stage facilities for grand opera and space for an organ. In December 1922, the Music Club inaugurated a campaign to see that an organ would be installed, and a committee was named to implement that objective. The next month, the committee presented arguments for an organ before the City Commission, and it was given authority to form plans and negotiate for an instrument. The committee's investigation pointed to Skinner, Austin and Casavant as the leading builders of the time. Casavant was then ruled out because it was a foreign builder. In addition to Skinner and Austin, Moller, Pilcher and Hall also submitted proposals. Skinner's proposal was found inadequate for the size of the building; Wurlitzer's unit design was rejected; detailed analysis of Kimball's bid placed it second to Austin's. In June 1923, it was announced that the Music Club had presented a formal report to the City Commission recommending purchase of an Austin organ for $44,549. Representatives of the Music Club visited every civic organization in the city to elicit support for the project, so that the newspapers were suddenly filled with headlines like "Realtors Want Organ Bought" and "Civitans Want organ Bought." On July 31 the Austin Organ Company proposal was approved by the mayor and commissioners and the contract was signed on August 7, 1923. In May of 1924, THE DIAPASON reported that Edwin H. Lemare had been engaged as municipal organist and would go to Chattanooga in time to supervise installation and finishing in the design of the organ. Due to Austin's experience with Lemare during their installation of Op. 500 at the City Auditorium in San Francisco, they were less than thrilled to be working with him again. His stinging criticisms and demands were considerable. Due to the changes he insisted in, completion of the organ was delayed from May 1924 to February 1925. Changes that Lemare made to the stoplist were good ones, though. The official Lemare touch was banishment of the hated crescendo pedal to the north forty; instead of being to the right of the Swell shoe, it was moved to above the right end of the pedalboard. The opening recital was played on February 12, 1925, to an capacity audience of ov er 4,000 people. When his contract expired four years later, he played his farewell recital on Mary 26th. He was well-liked in the city, he did not seek to renew his contract "as a consequence of attractiv e positions offered him in other cities. However, the Chattanooga position was his last regular one. He died five years later. Lemare's successor as civic organist was McConnell Erwin. The 34-year old native Chattanooga and blind musician had graduated from the Cincinnati Conservatory of Music and studied piano in Paris with Isidor Philipp and organ with Marcel Dupre. By 1932, support for the concert series had eroded and Erwin was donating his services. The series ended shortly thereafter. In 1940 a brief attempt by the Kiwanis Club and the WPA was made to start a concert series once again, but the project was short-lived. The organ was used only occasionally for many years after that. However, lack of maintenance and damage done during the 1964 renovation to "modernize" the auditorium (in gray and goldish-yellow - the favored colors of the times) contributed to the deterioration of the organ. Sometime in the early 1960s, the String division was kidnapped and taken to a residence south of Atlanta. By the early 1980s, the organ was barely functional. In 1985, Austin's Burton Yeager paid a visit to the organ at the behest of the Chattanooga Music Club to analyze the situation. It was found that 46 flue ranks were still playable, 21 ranks were unplayable and 14 ranks were missing completely. Evelyn Gibbs, long an active leader of the Chattanooga Music Club, as well as the AGO Chapter, and organist on the large 3-manual Austin at Brainerd Baptist, began spearheading an effort to have the organ renovation included in plans to renovate the auditorium. In December 1987, a very successful Christmas concert attended by nearly 1,000 people was held in the auditorium, featuring area organists, brass, choirs and soloists. Well-covered by the press and television, considerable publicity and support was garnered for the organ renovation project and, consequently, the auditorium renovation project. The Music Club actively helped to raise funds for the entire project, with many members calling on business and civic leaders. Then, when Miss Gibbs, a member of the Auditorium Renovation Committee, was out of town on vacation, the committee excluded the organ from the project. The funds which would have gone to the organ renovation went instead to renovation of the front entrance hall. The Chattanooga Music Club was out in the cold and had to start fund-raising for the organ renovation all over again, encountering resistance from those who said that, when they gave to the auditorium project in the beginning, it was with the understanding that the organ was included - and they would not or could not give again. 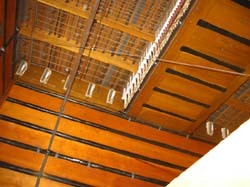 The auditorium renovation went forward after members of the Music Club and the Chattanooga Chapter of the American Guild of Organists carried thousands of pipes out of harms way from the chambers 30 to 60 feet above the stage along catwalks high above the floor below to safety in ceiling corner rooms at the opposite end of the building. It was dirty and dusty work; by the end of each shift, the workers looked like they were extras in an old Al Jolson movie. With the advent of the Chattanooga Meeting and Convention Center and the UTC Arena, the function of the Auditorium had changed. It was converted from from a flat-floor gold and gray room with folding chairs and the ubiquitous 1960s flying clouds to an elegant sloped-floor theatre-style room with comfortable theatre-style seats. Colors are tan, burgundy, silver and gold - a truly elegant look. The console was positioned in a box just to the left of the stage, in full view of the audience. Progress after the committee's decision in May of 1989 has been slow, but definitely steady. Evelyn Gibbs considers the word "No" from a potential donor or foundation to be a challenge, not a negative answer. The console and combination action was completely restored by Austin. Further mechanical work, done by Dennis Milnar and Associates, includes complete restoration of the Great (after the Music Club paid $40,000 to have a new lower ceiling put in the chamber to replace the higher damaged ceiling) and rehabilitation of the Pedal Bombarde unit, though it was subsequently damaged by a water leak. Led by Music Club member Dan McFarlan, a small group has steadily replaced much of the wiring of the organ. Alerted to the location of the kidnapped String division, Barger & Nix went down to Atlanta and rescued it -returning it to its home after a 30-year absence. Music Club and AGO members re-installed the pipes and Dennis Milnar restored the division. A new 75-foot cable was installed. In July of 2007, the Chattanooga Music Club celebrated the organ's restoration with a concert featuring Peter Richard Conte, the organist of the famed Wanamaker organ in Philadelphia, PA. A crowd of over 3,000 enjoyed patriotic tunes and orchestral transcriptions played on the newly restored Austin. On September 18, 2008, the Organ Advisory Committee met with Dennis and Derek Milnar to complete the details for the solid state system for the Austin Organ. Donations to the organ renovation project can be made to: Chattanooga Music Club, P O Box 3128, Chattanooga TN 37404. Information about the Soldiers and Sailors Memorial Auditorium came from John Wilson's book CHATTANOOGA'S STORY, printed by the CHATTANOOGA NEWS-FREE PRESS and available at area bookstores. Information on the organ came from the informative book AUSTIN ORGANS, by Orpha Ochse. It can be purchased through the Organ Historical Society. You can find the OHS website via the website for the Chattanooga Chaper, American Guild of Organists.